An origin story to Franklin J. Schaffner’s Planet Of The Apes, Rise Of The Planet Of The Apes centers on Will Rodman (James Franco). Rodman is a scientist at Gen-Sys, whose attempts to develop a cure for Alzheimer’s Syndrome have led him to experimentation on apes. When baby ape Caesar (Andy Serkis) is accidentally orphaned in one of these trials, Will takes him under his care. However, this single act of both compassion and arrogance leads to a war unlike any other. Whether it be developing several substantial themes or pitting humans against apes in a battle that engulfs the whole of San Fransisco, screenwriters Rick Jaffa and Amanda Silver generally strike a respectable balance. The action across the city, not least on the Golden Gate Bridge, will keep you on the edge of your seat, while the exploration of the ever relevant nature vs. nurture debate and humanity’s inherent destructiveness has you not only reaching for the tissues but also questioning the appropriateness of animal testing long after the end credits have rolled. In fact, the sections of the film taking place in the supposed “sanctuary” are very similar to the documentary Project Nim (co-incidentally also released in the in the UK this weekend.) Both films help us to understand what really lies beneath the dynamic between humans and apes. Equally, nods to Schaffner’s original film feel appropriate and well placed, respecting the everlasting impression Planet Of The Apes has made. Wyatt, who makes his mainstream debut after years of directing and producing indie fare, succeeds in the transition to big-budget spectacle, choosing quality over quantity and substance over style. His choice to mix handheld, obtrusive camera techniques with steady, wide-screen shots offers a chance for the audience to emote with both the chimps and humans alike. There is no labelling of either side as “good” or “bad”, so this mixed approach compliments the screenplay wonderfully. The action sequences in particular, namely the ones involving free-styling treetop cinematography, are some of the most spectacular to hit cinema screens all year, and truly define the term “escapism”. That said, there are times throughout when Wyatt and the screenwriters clearly spend too long attempting to make a character-based drama. While there’s not a boring moment per se, and the tendency towards character interaction and the formation of backstories doesn’t detract from the overall experience too much, it does decelerate the momentum an obvious amount. The film feels almost restless, rather than pushing forward in the way such a rich narrative demands. It is, however, Ceaser’s story, and it’s the revolutionary visuals provided by WETA that make Rise Of The Planet Of The Apes as special as it is. 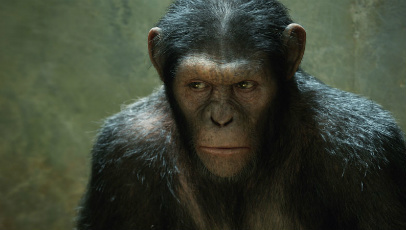 From the extraordinarily life-like motion-capture performance delivered by the hugely underrated Serkis – along with his support in the form of the other hundred or so apes – to the seamless blend between what’s animation and what’s real, the production team have redefined what can be achieved in post-production. New heights have been reached, and surely some Academy Awards nominations have already been secured along the way. In a slightly peculiar way, the human cast feel fleeced in comparison to Serkis’ Ceaser and the entire ape ensemble. While their story-arc is front and foremost, those of the humans feel dreary. Franco’s Will faces several ramifications and ethical predicaments relating both to his work and personal life, but we’re never presented with enough backstory or sentiment to ever fully emote with his character’s issues. His interaction with Ceaser, however, is competent and provides Rise Of The Planet Of The Apes with some of its most memorable and heartwarming moments – something that is praiseworthy in itself. It can never be easy for an actor to connect with something that isn’t there at the time of shooting. WETA’s technique of having Serkis actually acting on set makes a real difference, but Franco must nonetheless be commended for his undeniable finesse. Freida Pinto and John Lithgow, who play Will’s girlfriend and father respectively, both deliver admirable performances. Lithgow in particular steals several scenes with his comically aloof nature. However, neither are allowed enough screen-time for their presence to feel particularly necessary or have much impact on the overall narrative. Tom Felton and Brian Cox, who perhaps play the two most sinister characters, appear more as one-note caricatures. Their involvement is the most baffling. Suspenseful, absorbing and lavishly made, Rise Of The Planet Of The Apes is a much needed update to a truly classic franchise that manages to juggle exhilarating action, sincere emotion and culturally relevant subject-matter. It’s a truly rare species: a thrilling summer blockbuster that reaches a level of depth all too often confined to independent cinema.